Authorities have regained control of a prison after more than 12 hours of rioting described as the worst since the Strangeways jail riot 26 years ago. 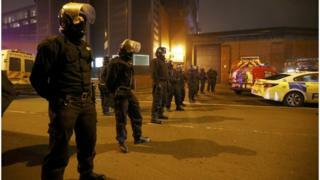 The Ministry of Justice said riot teams restored order to all four wings of HMP Birmingham just after 22:30 on Friday. They were deployed to tackle the disorder, which is understood to have involved up to 600 inmates. Justice Secretary Liz Truss said violence in prisons "will not be tolerated". The BBC understands that one prisoner was hurt during the riot and taken to hospital with a fractured jaw and broken eye socket. Prison wings are now being inspected to assess the scale of the damage after prisoners took control of the category B prison on Friday morning. Mike Rolfe, national chairman of the Prison Officers Association, said more than 30 staff had left the Winson Green prison in recent weeks and compared the trouble to the notorious Strangeways riot in 1990. He said: "This prison is a tough place to work, it serves a very big area, it serves a large, dangerous population of prisoners but it's not unlike many other prisons up and down the country, ones that have very similar inmates. "And we've been warning for a long time about the crisis in prisons and what we are seeing at Birmingham is not unique to Birmingham, but it certainly would seem that this is the most recent worst incident since the 1990 Strangeways riot." Rodger Lawrence, chairman of the Birmingham prison Independent Monitoring Board, said his members had not seen anything of concern during a visit earlier this week, but said the riot "didn't come as a complete shock" as there had been "a build up of frustration" over prison conditions. Trouble flared at the Birmingham prison, which is run by G4S, after an officer was "rushed" by inmates at around 09:00. Violence quickly escalated and due to the scale of the disturbances the Prison Service took over the incident and specialist Tornado units were deployed to regain control. Prison units from across the country were also drafted in to assist. Ms Truss thanked prison staff and emergency services for their help during the disorder. She said: "I want to pay tribute to the bravery and dedication of the prison officers who resolved this disturbance. "This was a serious situation and a thorough investigation will now be carried out. Violence in our prisons will not be tolerated and those responsible will face the full force of the law." During the disturbance the BBC was contacted by several men claiming to be prisoners at the jail, who said poor conditions were behind the disturbance. They said being on "lockdown" in their cells all day was a major factor that contributed to the trouble. Jerry Petherick, managing director for G4S custodial and detention, said the prisoners behind the trouble "showed a callous disregard for the safety of prisoners and staff". He said: "This disturbance will rightly be subject to scrutiny and we will work openly and transparently with the Ministry of Justice and other relevant authorities to understand the cause of today's disorder."